If you have any questions about any recipe, feel free to send me an email. You can also ask your questions in the comment section of that particular recipe. 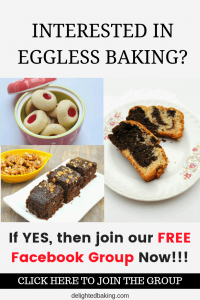 If you want me to post a particular recipe or maybe you want the eggless version of any classic recipe, then also shoot me a quick email (@delightedbaking@gmail.com) with the subject – Request A Recipe. I’ll try my best to experiment with your requested recipe and would share it, here, on delightedbaking.com. Did you try any of my recipe? I would love to read your feedback/review of the recipe. Send me your feedback/review at delightedbaking@gmail.com with the subject – Feedback. You can also send the recipe’s final photo/pic. I would love to share your recipe’s pic in my “Reader’s Feedback” Section.